Philippians 4:19 was perhaps the first verse I can remember memorizing. I was in college, and newly married, I believe. It was a very good verse to know, because it is true that God will provide. Today I am thankful for the great blessings God has given me. They are too many to list. Now, at the end of the day, as I sit in a quiet house with my cat lying on the chair with me, I am thoughtful. Is there anything that I have ever needed or that I will ever need that God cannot provide according to His riches in glory? If I need a car, He’s able to provide one. If I need a home, He’s able to provide that, too. He is able to provide salvation for me. He is able to provide healing in my relationships. He is able to provide guidance and strength. He is able to provide a peaceful heart. Through His riches in glory. 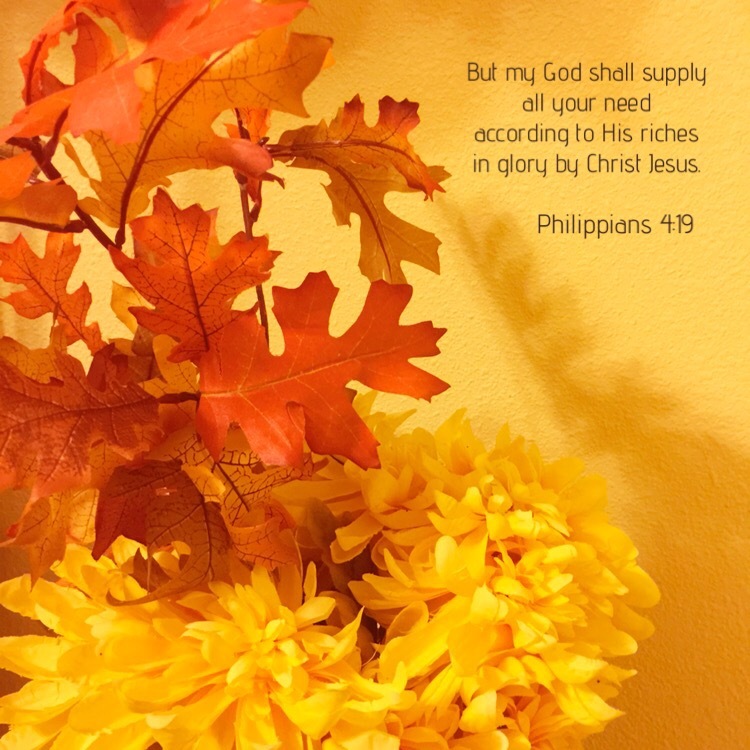 This entry was posted in Bible verses on photos, flower arrangements, Inspirational photography and tagged Jesus, provide, riches, Thanksgiving.